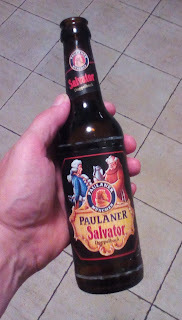 A seismic change is underway in the German beer industry, and few things demonstrate it as clearly as this: the original doppelbock, the classic Paulaner Salvator, is now in 33cl bottles. The standard size for Salvator, like almost every other German beer, has been a half-litre bottle - or latterly for some, a 50cl can. There were a few exceptions - Einbecker for instance, with its stumpy 33s, the flip-top 33s of Flensburger, and of course the little green bottles of Becks - but at least they had an individual look. But more and more now, instead you see the brown long-neck 33 that's become an international standard. It certainly looks like the Craft Beer revolution over the last few years in Germany has played a big part in this change. Perhaps to position their beers more as connoisseur items, or maybe to disguise their higher prices (which, to be fair, are at least partly due to using more and higher-quality ingredients), the new-wave craft brewers have generally preferred the smaller bottles. And when the macrobrewers went crafty, such as the cloudy brown Kellerbiers of Köstritzer, Krombacher and others, they too went into 33s. That the German macrobrewers are also now shifting their mainstream products - some Pils brands have been available in both sizes for a while, but only a few - is telling. Again, part of it will be to increase revenues - selling a 33 for 99 cents is €3 a litre, versus maybe €2.20 a litre last year. Another part though will be the changing expectations and preferences of drinkers, especially as beer becomes less of a generic commodity and more individual. Few people want to quaff a half-litre of something special; instead we prefer to savour something more like a half-pint, which for the Imperially-challenged is 284ml. It's noticeable how the 33cl "craft" bottles and cans in the UK normally sell for the same price as the 50cl PBAs and imported lagers. The price difference is even greater in Germany - premium local beer is maybe €1 to €1.50 for 50cl, whereas Craft tends to start at €2.50 for 33cl. There's a few crafty-but-excellent exceptions, such as Welde, Maisel & Friends and Distelhauser, that are a bit cheaper. Interesting - many thanks. I knew about Becks & Tannenzapfle, though for both it's a special bottle isn't it, not a standard one? I hadn't spotted the other macro-Pils in 330, nor Eichbaum or (non-crafty) Distelhauser. I will look again! Picked up Salavator in 330ml bottles couple of years ago in Florence. Intriguing - I wonder if they launched it for export first, and now in Germany too?